PhD student Caleb Dawson is using confocal microscopy to reveal the 3D structure of breast tissue. Breast tissue undergoes massive changes in structure during pregnancy and breastfeeding to enable efficient milk production. Researchers are using three-dimensional (3D) imaging to gain new insights into the structure of breast tissue and how this interacts with the immune system. Understanding how breast tissue changes throughout life can also provide clues for how breast cancer develops. Caleb Dawson, a PhD student in the Visvader-Lindeman laboratory, is using confocal microscopy to reveal the 3D structure of breast tissue. Breast tissue is made up of milk ducts that end in clusters of small lobes, resembling treetops. During pregnancy and lactation, this complex ‘canopy’ swells and remodels to produce milk, which is squeezed out into the branch-like ducts. Precisely how this remodelling occurs is difficult to study, as it requires visualising tissue changes with high resolution in 3D space over time. Mr Dawson is using confocal microscopy to acquire high resolution images from large scale areas of breast tissue. 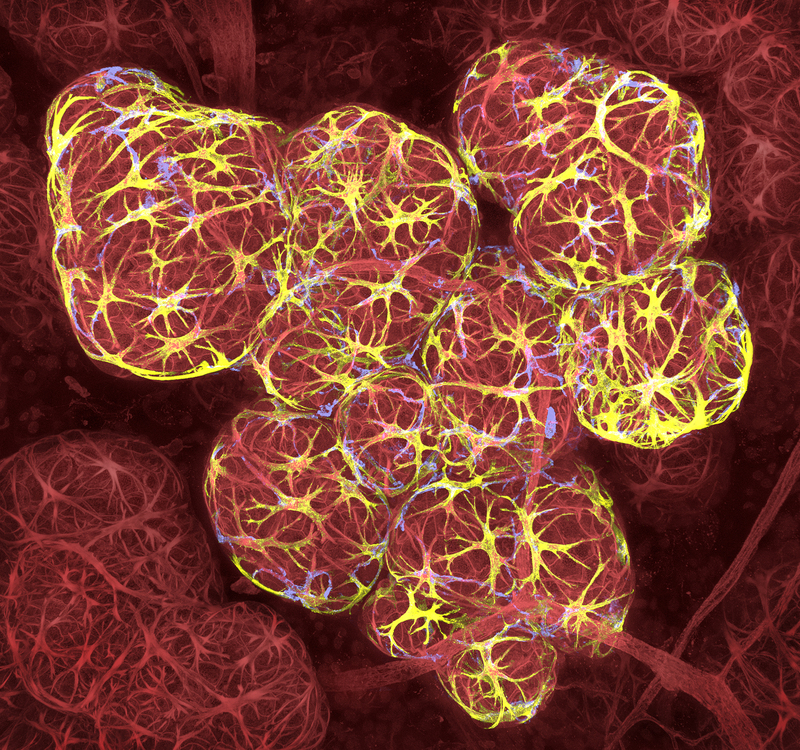 He uses these images to obtain quantitative information about how cells are organised and behave inside the tissue. Bioimage Analysts within the Centre for Dynamic Imaging help researchers like Mr Dawson create image analysis pipelines for the automatic tracking of thousands of cells and tissue structures. The imaging team also works closely with the information technology department at the Institute to ensure researchers can store very large image files and easily access resources for visualisation and analysis on high performance computers. Mr Dawson’s imaging experiments allow him to see the structure of breast tissue in exquisite detail. High resolution imaging over large areas allows him to identify rare but important immune cells that interact with the breast ducts. Mr Dawson is now using imaging techniques to study how immune cells cooperate with breast tissue to promote healthy remodelling during puberty, pregnancy, breastfeeding and weaning. Mr Dawson is also studying how the same immune cells that keep breast tissue healthy during development also protect breast tumours against immune attack. Ultimately, understanding how immune cells cooperate with cancer cells to enable tumour growth could open up new opportunities for cancer therapy. Researchers at the Walter and Eliza Hall Institute are discovering how and why breast cancers start. This is helping to advance better treatments for breast cancer.